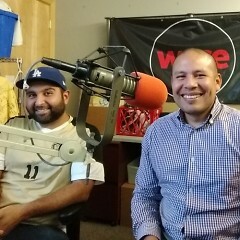 Host Jessica Young speaks with Jose Jimenez and Sergio Cira from Movimiento Cosecha GR, a peaceful movement that is fighting for dignity, respect, and permanent protection for immigrants in the United States. Host Jessica Young speaks with Jose Jimenez and Sergio Cira from Movimiento Cosecha GR, a peaceful movement that is fighting for dignity, respect, and permanent protection for immigrants in the United States. The group is working for an end to Kent County's contract with U.S. Immigration and Customs Enforcement (ICE). Catalyst Radio is the weekly public affairs radio program of Community Media Center. The program is a feature of WYCE and The Rapidian and includes interviews with organizations and people working on social change and community support, examines media and free speech issues, and takes a look at the behind-the-scenes of Rapidian reporting. You can catch it on air at noon every Friday on WYCE 88.1 FM or streaming on the Grand Rapids Community Media Center Website.